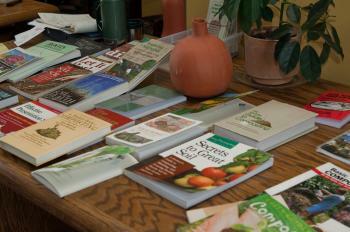 The following publications provide useful information about composting. Bokashi Composting, by Adam Footer, 2014, ISBN: 978-0-86571-752-7. Building Soil, by Elizabeth Murphy, 2015, ISBN: 978-1-59186-619-0. The Complete Compost Gardening Guide, by B. Pleasant and D. Martin, 2008, ISBN: 978-1-58017-702-3. Compost, Vermicompost and Compost Tea, by Grace Gershuny, 2011, ISBN: 978-1-60358-347-3. Dirt, The Erosion of Civilization, by David R. Montgomery, ISBN: 978-0-520-25806-8. Down to Earth, A Gardener's Guide to the Albuquerque Area, by Albuquerque Area Extension Master Gardeners, 2018, ISBN: 978-0-9700804-5-5. Ecology for Gardeners, by S. B. Carroll and S. D. Salt, ISBN: 0-88192-611-6. The Humanure Handbook, by Joseph Jenkins, ISBN: 978-0-9644258-3-5. How Soils Work, by Paul Syltie, 2002, ISBN: 1-591600-95-2. *The Informed Gardener Blooms Again, by Linda Chalker-Scott, 2010, ISBN: 978-0-295-99001-9. Let it Rot, The Gardener's Guide to Composting, by Stu Campbell,1998, ISBN: 13:978-1-58017-023-9. Life in the Soil, A Guide for Naturalists and Gardeners, by James Nardi, ISBN: 13:978-0-226-56852-2. Mycelium Running, How Mushrooms Can Help Save the World, by Paul Stamets, ISBN: 978-1-58008-579-3. Mycorrhizal Planet,by Michael Phillips, 2017, ISBN: 9781603586580. Natural Way of Farming, by Masanobu Fukuoka, 1985, IBSN-13: 978-818-598-7002. On-Farm Composting Handbook, by NRAES, 1992, ISBN: 0-935817-19-0. Organic Management for the Professional, by Garrett, Ferguson and Amaranthus, 2012, ISBN: 978-0-292-72921-6. The Rodale Book of Composting: Easy Methods for Every Gardener, by Grace Gershuny, 2018, ISBN: 978-1-63565-102-7. Secrets to Great Soil, A Gardeners Guide to Composting, Mulching and Creating Healthy Fertile Soil, by Elizabeth Stell, 1998, ISBN: 1-58017-008-0. A Soil Owner's Manual: How to Restore and Maintain Soil Health, by Jon Stika, 2016, ISBN-10: 1530431263. The Soul of the Soil, 4th edition 1999, by Grace Gershuny and Joseph Smillie, ISBN: 1-890132-31-4. Teaming with Fungi, by Jeff Lowenfels, 2017, ISBN: 9781604697292. Teaming with Microbes, A Gardeners Guide to the Soil Food Web, revised February 2010, by Jeff Lowenfels and W. Lewis, ISBN-13: 978-1604691139. Teaming with Nutrients, by Jeff Lowenfels, 2013, ISBN: 978-1-60469-314-0. The Worm Book, by Loren Nancarrow and Janet Hogan Taylor, 1998, ISBN-13: 978-0-89815-994-3. Worms Eat My Garbage, by Appelhof and Olszewski, 2017, ISBN: 9781612129471. The Worm Farmer's Handbook: Mid- to Large-Scale Vermicomposting for Farms, Businesses, Municipalities, Schools, and Institutions, 2018, by Rhonda Sherman, ISBN: 9781603587792. The local library has books on composting, vermiculture and soils. To search the catalog visit Albuquerque / Bernalillo County Library System. Dirt! The Movie . Well, this is for viewing, not reading, but it's a must-see, great resource. Here is a link to the film. Here is more about the film. The Indore Method of Composting: Foundation of Modern Organic Agriculture, by Anneliese Abbott, in Acres U.S.A. 49, no.1 (January 2019): 38-42.